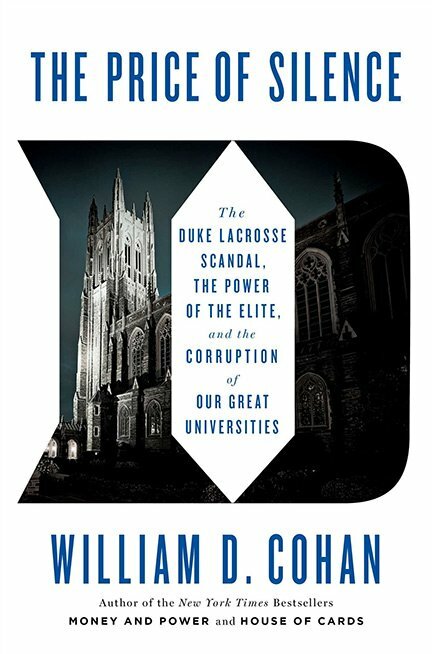 William D. Cohan, a Duke alumnus and author, is the bestselling author of Money and Power, House of Cards, and The Last Tycoons. He is also a contributing editor at Vanity Fair, a columnist for BloombergView, and a regular contributor to the Atlantic, the New York Times, Bloomberg BusinessWeek, and ArtNews. He is the winner of the 2007 Financial Times / Goldman Sachs Business Book of the Year award. He has appeared on The Daily Show, Charlie Rose, CBS This Morning, ABC World News, Good Morning America, Bloomberg TV, MSNBC, CNBC, CNN, Marketplace, The Diane Rehm Show, and many other programs. The Price of Silence is a deeply-reported and brilliantly written examination of the 2006 Duke lacrosse team case. The true story of what happened has never been told in its entirety, and it is far more complex and profound than all the reporting on it to date would indicate. What happened at Duke explains how power works at the highest levels of ambitious academic institutions, which is to say that power always protects itself, even if at a great cost to others. Cohan tracks the fates of the key characters in the drama and updates the story, which even now contains new developments. His account is addictively intense. William D. Cohen, author of The Price of Silence, is our Keynote Speaker. The Keynote Event is Friday, September 26, 2014 at 7:30 pm at the Mayo Performing Arts Center. Tickets for the Keynote Address are $20 for General Seating. To order tickets, please visit the Mayo Performing Arts Center Box Office or call the Box Office at 973-539-8008. Tickets are also available for ordering online by clicking here. If you are a donor, special seating will be available in the Sponsor Section. All tickets are available for pick-up at the Mayo Performing Arts Center Box Office.